As we saw in part 1, it is now believed that Carlo Bergonzi’s teacher was Vincenzo Rugeri. Once alerted to the possibility of a working relationship between these two makers, the indications of this in Bergonzi’s work become easier to see. The most distinctive characteristic of Bergonzi’s style is the sharply defined scroll, with the strong center forming a precise axle on which the volute turns. This projects far from the lean face and first turn of the spiral in a striking manner, and is touched by only the lightest chamfer. These stylistic traits all seem to relate to the scrolls of Francesco and Vincenzo Rugeri, which are similar in conception and execution although not so fully developed. Another interesting connection is with the unusual style of early scrolls by Guarneri ‘del Gesù’, which also appear in the 1720s. ‘Del Gesù’ freely adapted elements of the Stradivari style and others into his work, which by the late 1740s features a scroll that is almost a caricature of the classical Bergonzi model. There are many other indicators in Bergonzi’s mature work that the two makers were if not actively co-operating, at least very aware of each other’s ideas. Vincenzo Rugeri, Bergonzi and ‘del Gesù’ all adopted the habit of ‘scarfing’ the linings into the corner blocks, making a sloping cut on the end of the linings to make it easier to slip into the mortice than the traditional squared joint. On the broader scale, the most common perception of the Bergonzi style is that of his unique outline, with wide, squared upper shoulders, prominent upper corners and a comparatively narrow waist. But this does not hold true for earlier examples from the 1720–30 period, which are far more conventional in their proportions, and indeed very Rugeri-like. With so few genuine labels to rely on, tracing the development of Bergonzi’s style from its origins is tricky. One example with a label of 1723 unfortunately lacks its original front, but all the other distinctive elements of form and structure are in place. The established Amatese form is changed only slightly. An undated exemplar of this early style is the ‘Paganini’, attributed to c. 1720. 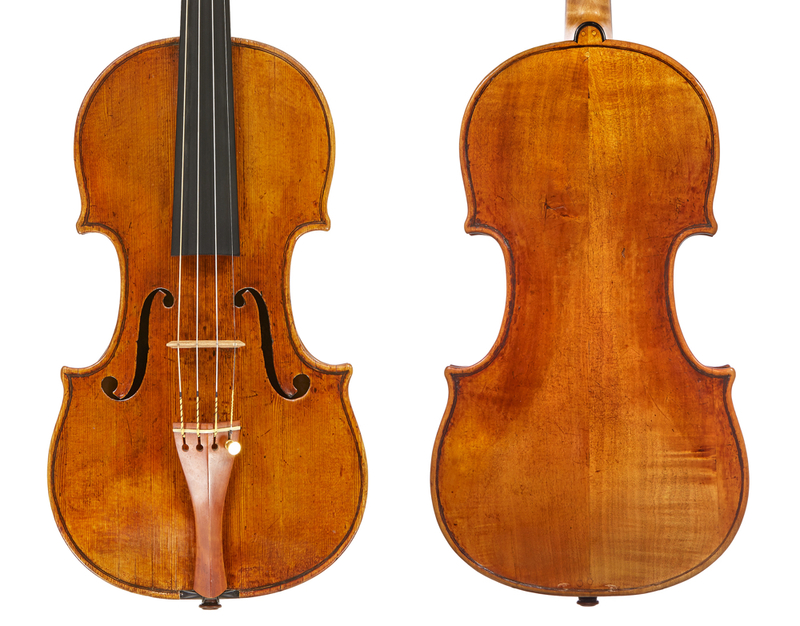 Although the ‘Paganini’ has a conventional one-piece back of handsomely figured maple, the 1723 violin uses a striking piece of native Italian ‘oppio’ or field maple. This has a characteristically extremely deep and narrow figure and appears in a number of Bergonzis, which may be assumed to be of a similar period, including the ‘Gillot’, and ‘Tonge’. What is interesting is that Stradivari also used a succession of oppio backs of very similar appearance during the years 1722–25, including the 1722 ‘Vallot’, ‘Jupiter, Janze’, ‘Laurie’ and ‘Vollrath’ and the 1723 ‘Spanish, Partello’, ‘Edler’ and ‘Jules Falk’, which show a strong, dark sap line which also appears on the ‘Gillot’ Bergonzi. 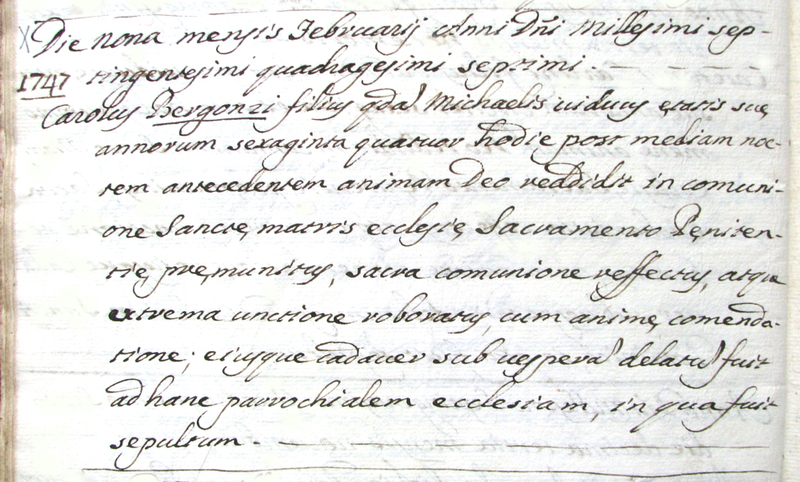 It may be assumed that a particularly fine log of oppio was brought to Cremona in around 1721–22. There are two molds in the Museo del Violino in Cremona attributed to Bergonzi, cataloged as ms. no. 1060 and ms. no. 1065 (1060 autographed by Zosimo Bergonzi, Carlo’s son), but they seem to have been used concurrently and it is very hard to distinguish differences. Mold 1060 is wider in the center bouts but narrower in the upper and lower bouts than 1065, but by less than 2 mm. Both are narrower across the center bouts than Golden Period Stradivari patterns, but compatible in the upper and lower bouts. They are consistently shorter in length than most Stradivaris too; Bergonzis very rarely exceed 353 mm in length, like ‘del Gesù’ violins. There are also rare examples that fall outside the possibilities of these two molds, made on either smaller or substantially larger models. The 1723 violin and the ‘Paganini’ are almost certainly from the 1065 mold, while 1060 probably generated the c. 1736 ‘Segelman’ and the c. 1732 ‘Perkin’. In fact the instrument outlines that most closely match Bergonzi’s are those of ‘del Gesù’, particularly his forms from the later 1730s, such as the 1737 ‘Joachim’; the geometry of the center bouts is clearly shared between the two makers. Another possible link with the working practice of ‘del Gesù’ is Bergonzi’s obvious willingness to play with the rib garland on the mold, allowing wider outlines and varying corner shapes just by altering the cut of the blocks and the fit of the ribs against the mold. The two makers also appear to share the technique of varying the actual edge and overhang width, and these comparatively delicate early works are distinguished in this way from the much more massive appearance of later instruments. In the early years beech purfling is occasionally found in Bergonzi instruments, a material only otherwise used by the Rugeri in Cremona. Early Bergonzi soundholes are very Rugeri-like also, with narrow lower wings and small circles. The first identifiable development by Bergonzi is in the alteration of the corners, giving them not only greater width and a more Stradivarian form, but a greater width across the incurve of the upper corners, giving that strong contrast with the center bouts that is indeed Bergonzi’s hallmark. This is an example of a change that could have been simply made by altering the corner templates themselves, without adjusting the mould. Bergonzi was fond of extending the corners, but one of his few weaknesses reveals itself in the sometimes rather loose purfling mitres and clear knife marks from initial cuts. They seldom fill the length of the corner as neatly as a Stradivari or an Amati inlay, and this is something Cozio di Salabue comments upon in his notes. The soundholes also become bolder with the passage of time, following a curiously similar line of development to those of Guarneri ‘del Gesù’. They grow and take up more space on the front in the same way, a tonally significant change. The wings become wider, the whole aperture wider and longer, and swept outward towards the edges. The overall length of a Bergonzi soundhole in his mature period is about 4mm longer than a Stradivari example. While ‘del Gesu’ kept to a reduced stop length of around 192mm, Bergonzi consistently extended this to around 197mm. Early Bergonzis tend to have a slightly pinched arch, but this becomes flatter, yet artfully full in the curves in later years. Cozio di Salabue criticised him for making ‘the cross archings too low’ and also commented that Bergonzi violins made between 1735–36 are thin in the plates, ‘imitating large Stradivaris’. Here is a major departure in practice between Bergonzi and Stradivari. Although accurate information is sparse, in my experience Bergonzis are indeed generally a little thinner in the plates than Stradivaris, and certainly a great deal less than ‘del Gesù’, whose instinct I believe was always to leave the plates heavily wooded. One of the finest existing examples of what might be called Bergonzi’s mature period is the 1733 ‘Kreisler’, made when Bergonzi was 50 and one of the few to retain its original label, providing a key to the chronology of his work. It was in Cozio di Salabue’s collection from 1776 to at least 1816 and he describes it as ‘my largest and best… the strongest I have ever owned and that I have ever heard’. The measurements he provides are very close to those of the actual violin and he accurately describes the Stradivarian soundholes, set close to the edge. 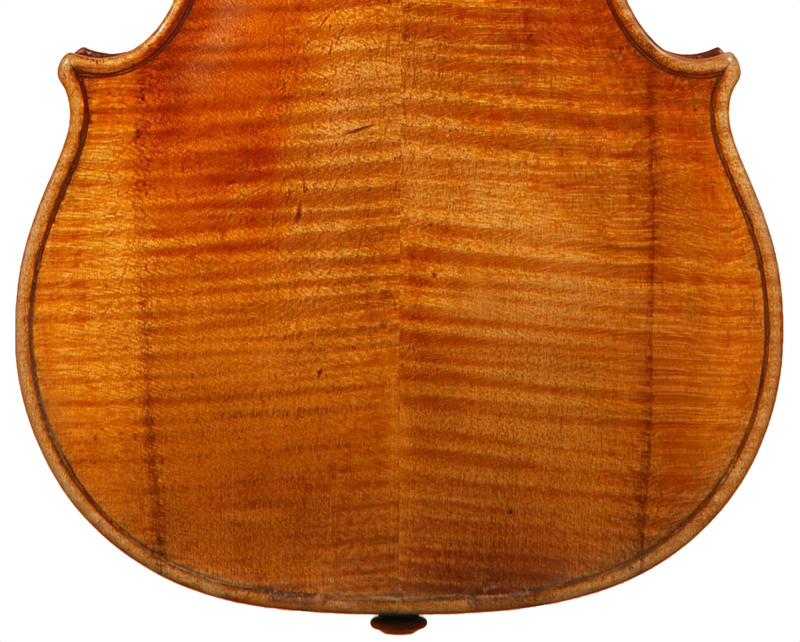 On this violin, as on all examples where the detail survives, the back button is cut with deep notches at each side, a quirk of style more often associated with Stainer. Carlo Bergonzi’s work has more ‘tells’ than most Cremonese makers. Various technical aspects of his work belong to him alone, from the distinctive internal work to the manner of making the ribs without any easily discernible taper from lower to upper block. The ribs often bear toothed plane marks both internally and externally. His scrolls, with their particularly delicate chamfer, do not usually bear the black outline that is familiar from Stradivari and Guarneri. Another violin assumed to be from Cozio’s collection is the 1736 ‘Vinegra, Wallace’, which presently bears a facsimile Stradivari label but accords to Cozio’s description of a 1736 Bergonzi and has therefore been ascribed this date in the Reuning catalog. It is a fascinatingly pure work, covered with a particularly deep red varnish that is comparable to Stradivari’s best from the same period. It is unusually dark for Bergonzi, but perfectly illustrates Bergonzi’s reputation as one of the most able varnishers of Cremona. 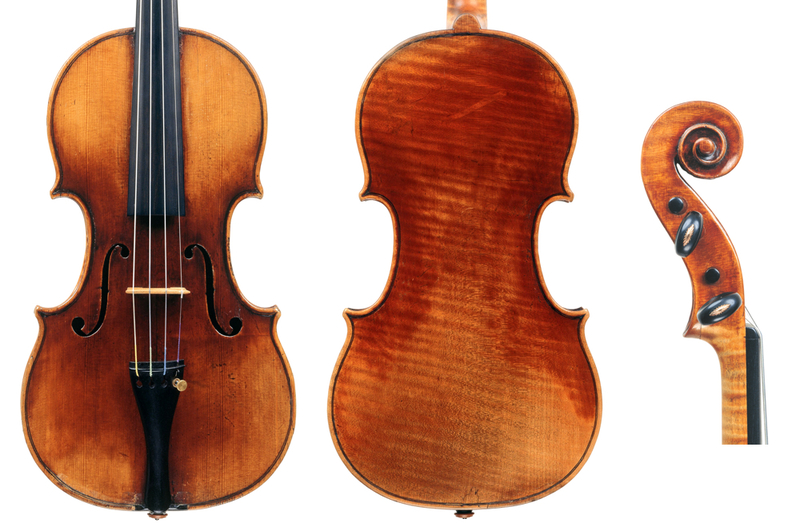 His varnish varies throughout his career, and in the early years seems to follow Guarneri ‘filius Andreae’ in approach, with a strong ground and intermediary layers beneath the orange-toned color coat. But with the gradual increase in the intensity of the top coat, which was presumably applied more thickly and in more heavily pigmented layers, a craquelure often develops on the surface which is rarely encountered in Stradivari’s work, but does appear in Guarneri and the late instruments of Girolamo Amati II. This varnish is also typically applied very close to the wood in the 1733–36 period, with little evidence of an isolating coat either visually or under ultraviolet inspection. This gives the wood an almost stained intensity of color that is very distinctive among Cremonese work. Another consistent feature is Bergonzi’s beautiful choice of maple. From around 1725 even Stradivari’s wood selection became very uneven. The beautifully figured wood of the Golden Period gradually gives way to plainer cuts and increasing use of native Italian oppio rather than the imported species. It seems as if he chose not to invest in new stock, although both Bergonzi and ‘del Gesù’ were somehow able to continue using wood of the very first quality throughout their careers. Bergonzi does seem to have been fond of oppio, but the pieces he used are always spectacularly figured with the characteristic deep, narrow horizontal flame. From 1744, however, plain beechwood backs do appear in the work of both ‘del Gesù’ and Michelangelo Bergonzi, perhaps another indication of a crisis in the profession at this time. Several Carlo Bergonzi instruments also show small inlays, done to repair flaws in the wood; the ‘Perkin’ of c. 1732, and the early ‘Wilson, Trombetta’ are examples. The latest known authenticated label of Bergonzi is found in the 1744 ‘Eddy Brown’ violin. This, like the strongly-built ‘Segelman’ attributed to 1736, sees a return to the older form of soundhole, with narrower lower wings and smaller circles. The tendency is to see the strengthening hand of Michelangelo in these late instruments; he was only 15 in 1736, but doubtless already assisting his father. His own labeled work begins to appear in 1744, the year of the death of Giuseppe Guarneri ‘del Gesù’, a maker who seems to have had as strong an influence on him as his father. In works ascribed to the father and son working together, the soundholes tend to be of the older type, with smaller circles and more conventional setting. In 1745 Carlo Bergonzi joined the Stradivari workshop and his family moved into the Casa Stradivari to assist in finishing instruments remaining there after the deaths of Antonio in 1737, Omobono in 1742 and Francesco in 1743. Several interesting instruments are the result, including the Bergonzi ‘Hart’ viola, nominally dated 1737–1742, but which is clearly made on Stradivari’s ‘CV’ form and uses wood identical to that of the ‘Gibson’ Stradivari viola of 1734, although in this case peppered with more inlaid repair patches. The wonderful ‘Spanish’ cello of c. 1738–40 was made on Stradivari’s ‘B piccolo’ mould and again shows these inlaid repairs. The head is perfectly identifiable as Bergonzi’s work, precisely the same scroll being found on two other late Stradivari cellos, the 1732 ‘Pleeth’ and 1730 ‘Fruh’ – all lacking the familiar Stradivari blackened chamfer but consistent with Bergonzi’s own practice and style. These latter two may have been labeled prior to Bergonzi’s regular involvement with the Stradivari workshop and the scrolls added by him later. Oddly, Cozio di Salabue states that Bergonzi’s ‘cellos were better made than his violins’ and he lists ‘an intact cello of Bergonzi dated 1746’. This may have been intended to increase interest in an instrument he had for sale, but it was generally understood that Bergonzi made no cellos or violas at all until the relatively recent attribution of these Stradivari workshop instruments. What is most bizarre is the habitual mislabeling of Gofriller cellos as Bergonzis in the 19th century, perhaps based on this statement of Cozio’s. Carlo Bergonzi’s time in the Stradivari workshop lasted only two years until his death in 1747. 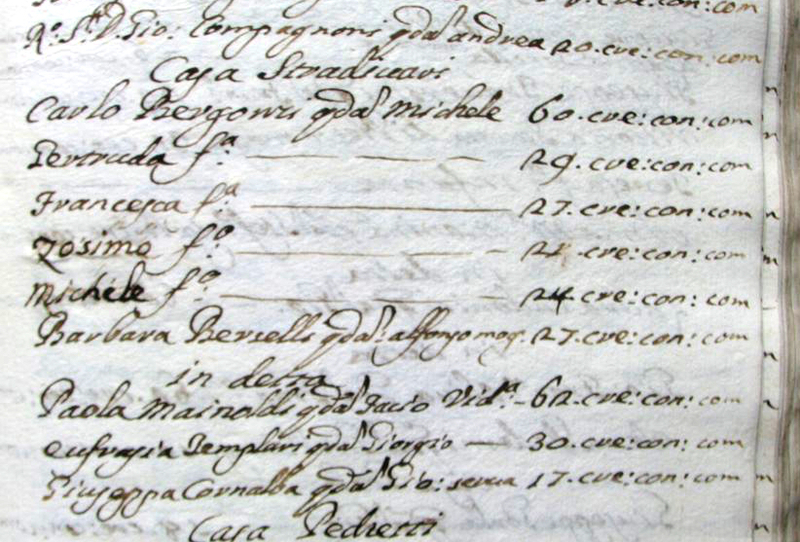 It is interesting to consider that while he was working on Stradivari’s stock, assisted by Michelangelo, several of his own instruments were also left unsold; four examples noted by Cozio di Salabue were all ‘kept by Bergonzi (unsold) in his shop’ and acquired from Bergonzi’s son-in-law in 1776. Cremonese violin making was surely in a parlous state by this time. 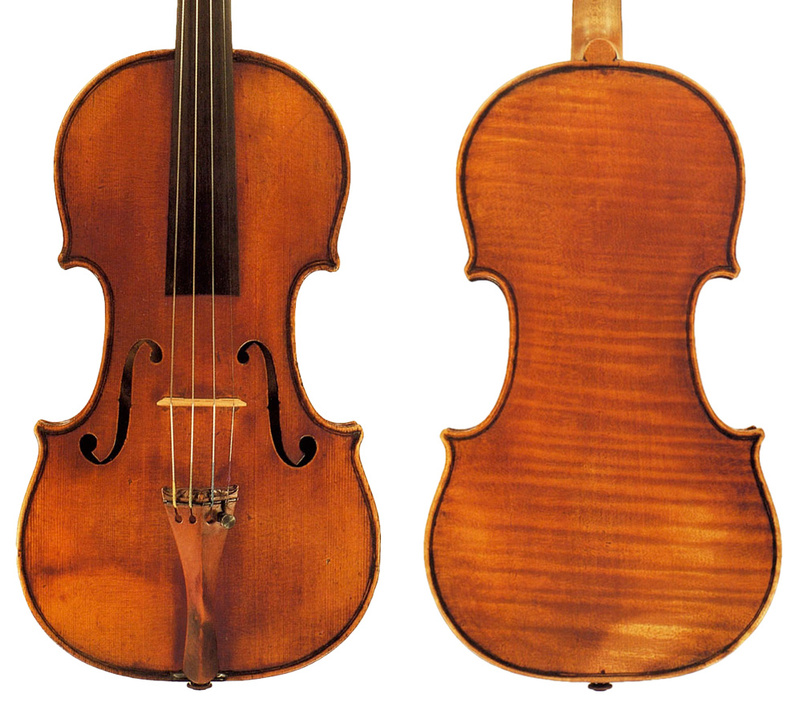 Guarneri ‘del Gesù’ died in 1744 and Carlo and Michelangelo were the last of a great tradition. In Michelangelo’s work we see a confirmation of the influence of ‘del Gesù’ on himself and his father, and strangely little impact from the 150 or more instruments that we know surrounded them in the Stradivari workshop. Carlo Bergonzi’s violins are often described by players as a cross between ‘del Gesù’ and Stradivari in terms of playing quality. While this is understandable considering the obvious cross-pollination of ideas between all three makers, the comparatively small selection of original instruments we have to compare makes this seem like a rather sweeping generalisation. In outline and in arching there are are similarities between Bergonzi and ‘del Gesù’. In graduation of the plates, Bergonzi seems to follow the Stradivari patterns. It might seem simplistic to attribute to this the perceived idea that Bergonzi offers a combination of Stradivarian and Guarnerian tone qualities, but what is certain is that Bergonzis rank with the very finest instruments. Whatever interpretation we may try and put on all these different influences and approaches, we are left with the fact that Carlo Bergonzi was a highly individual and original maker. His death at the age of 64 in 1747 pretty well ended the great period of Cremonese violin making and it is a great pity that he made so few instruments. Carlo Bergonzi, Alla scoperta di un grande Maestro, ed. Christopher Reuning, Fondazione Antonio Stradivari, Cremona, 2010. Duane Rosengard, Carlo Bergonzi and his Son, ed. Christopher Reuning, Consorzio Liutai Antonio Stradivari, Cremona, 2010. Dmitry Gindin and Duane Rosengard, The Late Cremonese Violin Makers, Edizioni Novecento, 2002. Count Cozio di Salabue, Memoirs of a Violin Collector, ed. Brandon Frazier, 2007. John Dilworth, Cremonese Mystery Man, The Strad, vol. 106 no. 1262, June 1995.